The Gist of it: A group of stagestruck wisecrackers live and argue together in a boarding house while they wait for Broadway to call. The day begins much like any other day at the Footlights Club, a theatrical hotel for aspiring stage actresses. The maid�s singing off-key, the girls are cracking jokes, Judy (Lucille Ball) is making a date with one of her boyfriends, and the wittiest of the lot, Jean Maitland (Ginger Rogers) and her arch nemesis, Linda Shaw (Gail Patrick), are fighting as usual. Ah yes, it's just an ordinary day at the Footlights Club- until Terry Randall (Katharine Hepburn) shows up. She isn�t like the other girls in any way. The rest of the residents of the club are sort of starving artists, living off their wits and struggling to make ends meet while await their big break. Then in comes Terry, with expensive clothes and �fancy language� that leave no doubt she is an educated, prim and proper young lady from a wealthy family. Forced to room together, she and Jean are at each other�s throats from the moment she arrives. The girls are absolutely baffled by Miss Randall�s presence in a place like the Footlights Club. Like them, Terry left the comfort of her family�s home to make it big as an actress (much to the chagrin of her father). The difference between she and the other girls is that her family is wealthy. She�s come to the big city to absorb some �atmosphere� and become a success "without the aid of the family millions". She wants to make it on her own. She tries to fit in but finds she�s hopelessly misplaced around all the wisecrackers with whom she�s living (although she more than holds her own in the comebacks department). One of the girls is friendly to her right from the start, a sweet girl named Kaye (Andrea Leeds). She�s the most downtrodden, the one that seems to be having a tougher time than the rest. A year earlier she had been a Broadway star - this year she can�t even get an audition. She�s desperately trying to win the year�s most coveted role, the lead in Enchanted April. After a while, once they get to know her better, the girls do come to have a modicum of respect for Terry. Meanwhile, as Jean starts getting along with Terry, her feud with Linda intensifies. One of her favorite topics to ride Linda about is her relationship with Anthony Powell (Adolph Menjou). He is a well to do theatrical producer fond of dating younger women and keeping them wrapped in furs and covered in jewelry. One day Powell sees Jean and immediately tries to work his charm on her. At first she completely ignores his attention but he continues his pursuit by getting her a job dancing in a nightclub he owns. On her first night, sitting ringside with Powell is Linda. During the performance Jean hears Linda making a few biting remarks about her, so when Powell asks her out again after the show, she accepts. However, Linda is familiar with his antics and tells Jean about it. When a young lady first captures Powell's interest he�ll send flowers and gifts. But he�s eternally fickle, he tires of his girls quickly. He�s a big, important man with a lot of money, so when he�s through with one girl there�s always another waiting to take her place. Jean of course, doesn�t pay any attention to Linda and somehow falls for Powell, allowing herself to believe she means more to him than anyone he's dated in the past - until one night when she receives a familiar Powell message saying he won�t be able to keep their date - meaning he�s moved on again. But Jean is not one to take anything lying down. She marches up to his apartment and to her astonishment, the other girl he�s with is none other than Terry Randall. Don�t get the wrong idea, Terry�s not as susceptible to Powell�s charms as the others. In addition to leading his complicated love life, Powell is also the producer of Enchanted April (the most anticipated play of the season). One day he is approached by a man who says he has a client interested in investing his money in the show. This "client" turns out to be Terry�s father. He has a scheme that he hopes will fulfill his daughter�s �silly� desire to become an actress and bring her home at the same time. He doesn�t think she could possibly be any good at acting. So his idea is to pay for the show on the condition that Powell cast Terry in the lead. Then, (he hopes) the show will be a flop, Terry will forget about the stage and come running home. Terry knows nothing about her father�s scheme, so when Powell invites her up to his apartment and offers her the part, she�s delighted. Kaye had her heart set on getting the part and is despondent (yet not angry with Terry) about the way things turned out. Kaye is the most-liked girl at the club, so the fact that Terry was given the part everyone knew Kaye wanted makes her a very unpopular girl. Nevertheless, production begins on Enchanted April with Terry in the lead. As rehearsals begin we find out Terry�s father was right, she has no acting talent. To his delight, it looks like the show is going to be a failure. Finally, opening night arrives. Kaye, although heartbroken, is not bitter towards Terry and tries to help her through her opening night jitters. Kaye�s too sick to attend the performance (suffering from malnutrition), so once Terry and those attending leave for the theater she�s left alone with her thoughts. Memories of her opening night a year earlier fill her head. Soon the voices and sounds of that night are all she hears. She begins to loose her mind and jumps out of the window. Back at the theater, curtain time nears and Terry�s about to go on when Jean tells her about the tragedy, tells her she broke Kaye�s heart by accepting the role so it's her fault. Terry says she just can�t go on after what�s happened, but she�s talked into doing it for Kaye. She goes out there and to everyone�s surprise, she gives a magnificent, emotionally charged performance. In the curtain speech she dedicates her performance to Kaye, saying it should have been her up there. Terry�s despondent and instead of seeing the press after the show, she goes with Jean to see Kaye. That curtain speech causes everyone to revise their- negative, to say the least, opinion of Terry. After that, the film skips to a few months later, everything�s back to normal at the Footlights Club. Terry�s close friends with all the girls now. It�s a typical day again, everyone spouting wisecracks, the maid singing off key and Linda and Jean fighting. Judy Canfield has gotten engaged and the girls give her a send off to a peaceful, more ordinary kind of life. Shortly after Judy's departure, a new girl arrives, one with the same hopeful look in her eyes Kaye once had and the same quality about her that Terry has, one that makes her seem just a little different from the other girls. Is history repeating itself? We're left to draw our own conclusions. 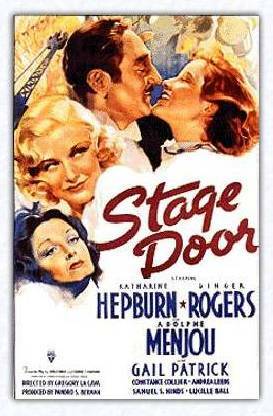 Stage Door was one of the most prestigious pictures in which Lucille appeared in her young career. It was based on the hit Broadway play by Edna Ferber and George S. Kaufman. RKO acquired the film rights and placed their two biggest female stars, Katharine Hepburn and Ginger Rogers, in the lead roles. 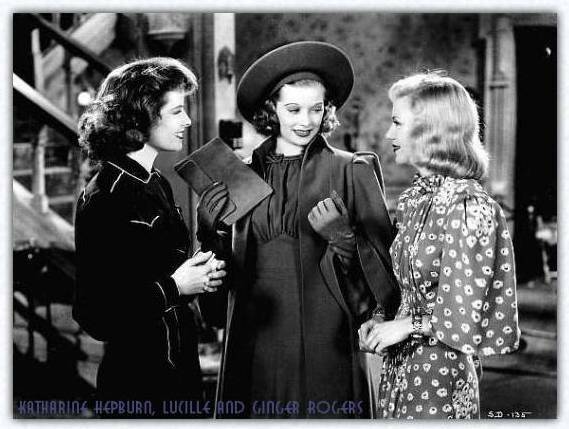 Lucille said it was through the influence of her mentor, Ginger's mother, Lela Rogers, that she was given the part of Judy Canfield, a wisecracking aspiring actress. In addition to Lucille, other young future stars featured in Stage Door were Ann Miller and Eve Arden. At RKO Lucille had made many friends among the other contract players, and with such a large cast she said, "It was a treat to even be a part of it." They began shooting Stage Door without a finished script, so the director, Gregory LaCava, encouraged the girls to improvise, hoping to achieve a spontaneous, natural feeling of just a bunch of friends getting together. He studied them during their breaks and hanging around the set to get ideas of how they would normally talk to each other. His "make it up as you go along" method worked beautifully. It could have turned out badly but the cast was fantastic. I have yet to see better chemistry between a group of girls in a movie. His work in the film earned LaCava an Oscar nomination for "Best Director". The film received excellent reviews upon it's release, and Ginger finally proved to the critics she was more than a musical comedy star, she was an exceptionally talented actress who faired equally well in straight dramas. In addition to Ginger, there were so many fine performances from all the girls in the cast, garnering Andrea Leeds a "Best Supporting Actress" Oscar nomination for her portrayal of the suicidal Kaye Hamilton. Though Lucille's part was small, she really did make the most of her screen time, bringing her comic skills to the forefront whenever she opened her mouth. It wasn't long before the studio began casting her in leading roles in "B" films. She was finally through playing bit parts.